Originally published under the title "Trump and "Arab NATO": Be Careful What You Wish For." According to the London-based Arabic newspaper Asharq al-Awsat, Trump privately pressed Arab leaders to form a NATO-like alliance during his visit to the region earlier this month. President Donald Trump reportedly landed in Saudi Arabia earlier this month with dreams of forming an "Arab NATO" to fight the Sunni Islamist terrorists in the Islamic State (IS) and al-Qaeda (AQ) as well as Shi'ite Islamist Iran. In an historic speech at the first Arab Islamic American Summit in Riyadh on May 21, he rightly named the main enemy as Islamist ideology, and boldly rallied the heads of the Arab and Muslim worlds to unite to take up the fight themselves. Though his "Arab NATO" idea was getting a lot of media buzz for some weeks prior to his maiden trip abroad as president, he did not mention it in his address to the 55 leaders in Riyadh. 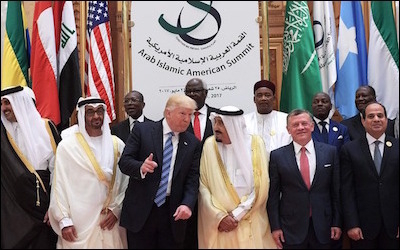 However, according to the London-based Arabic newspaper Asharq al-Awsat, Trump pushed the concept with "several Arab leaders." The idea apparently aroused interest at Thursday's NATO summit in Brussels, which Trump attended. The name 'Middle East Treaty Organization' has an eerie history. "The plan is moving forward and is being studied," a diplomat told the paper, which said the proposed new organization will be called the Middle East Treaty Organization (METO). The name has an eerie history. In 1955, Great Britain, Iran, Iraq, Pakistan and Turkey, backed by the U.S., founded the first Middle East Treaty Organization – dubbed the Baghdad Pact – to oppose the spread of Soviet influence and radical Arab nationalism, then emanating from the Egypt of firebrand dictator Gamal Abdel-Nasser. 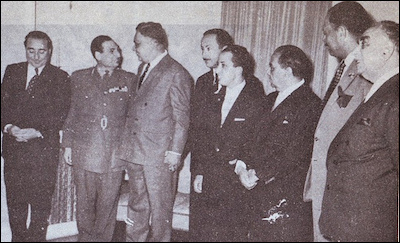 The fatal moment for that alliance came early, in the violent overthrow of the British-backed Iraqi monarchy by Arab nationalists in 1958. METO, renamed the Central Treaty Organization (CENTO), then moved to Ankara, where it sputtered on toothlessly until its death with the Iranian Revolution in 1979. Leaders of the first Middle East Treaty Organization, 1955. The new METO appears to be different from the Islamic Military Alliance, originally proclaimed by the Saudis in 2015, which then seemed to vanish as mysteriously as the army of Persian King Cambyses II, lost on a trek to the Egyptian oasis of Siwa circa 524 B.C. The Riyadh Declaration, issued by Saudi King Salman following the latest summit, claimed the leaders of the nations that took part had pledged a force of 34,000 "reserve" troops to fight terrorism--though the leaders were apparently not consulted in issuing the statement. Whatever its name, some sort of new military architecture is definitely needed to deal with these threats. Theoretically, there are some other options already in existence that could be adapted for purpose, but all are seriously flawed. For example, there is the largely feckless, Cairo-based, 22-member Arab League—whose member states often don't get along, big league. Then there is President Barack Obama's alleged 60-nation coalition to confront IS, in which but a handful of Middle East partners—primarily Jordan, Iraq, Saudi Arabia, the United Arab Emirates, and the ever-ambivalent, more and more Islamist Turkey—have really shouldered the burden. Trump's vaguely-floated concept appears riddled with problems and wishful thinking. In fact, Trump's vaguely-floated concept appears riddled with problems that show how an administration so much better than its predecessors at diagnosing the problem (the threat of Islamism, not just terrorism), still suffers from wishful thinking about the region. One line in Trump's speech at the summit perhaps reveals the conundrum, "The Lebanese Army is hunting ISS operatives who try to infiltrate their territory." That may be true, but the same Lebanese Army is itself infiltrated by, and cooperates with, Hezbollah – which Trump correctly castigated in the same speech. Indeed, any Arab NATO must ultimately include Russian satellite Syria, plus Iraq, both fatally bound to Iran and consumed by internal conflict. As this writer noted in a recent foxnews.com op-ed ("Trump Told the Truth in Saudi Arabia. What Happens Next Could Be Interesting," May 24), the Saudi king, Salman, and Egypt's president, Abdel-Fattah al-Sisi, along with Trump, may form an Arab-based triumvirate to lead the resistance to Sunni and Shi'ite jihadism. But Trump's idea is to put Saudi Arabia in charge of the organization, when Egypt is the traditional leader of the Arab states. And Egypt—driven to seek massive Russian military assistance for the first time since 1972 by Obama's suspension of most of our annual aid to Cairo in 2013 (since resumed with more strings attached)—refuses to intervene in Syria and balks at confronting Russia's BFF, Iran. Then again, the Russia angle might not even bother Trump, who has formerly praised President Vladimir Putin, and is still generally soft on Moscow, which has shown no genuine interest in fighting IS, despite claims to the contrary. So beyond the rhetorical level, it mainly boils down to the Gulf Cooperation Council (GCC), an organization which already has a limited military dimension--plus perhaps Jordan, already playing a key role in fighting IS and AQ, and officially at peace with the Jewish State, but hampered by the prominent role of the opposition Muslim Brotherhood and ties to its Palestinian branch, Hamas. Any alignment that could turn into a heavily-armed coalition against Israel should be pondered deeply first. The GCC states might informally flirt with our strongest ally Israel, but are a long way from formal recognition yet, despite having occasionally open commercial, and quasi-diplomatic, relations at times. Most problematic is Qatar—notorious for funding Islamists from Libya to Egypt to Syria, from Gaza to Afghanistan (including Hamas and the Taliban), though it also hosts America's Central Command. Yet the quest for Arab unity, a mirage since the heady days of Nasser, who brought about the greatest Arab defeat in history in 1967 after waging a futile war in Yemen, continues. As does the hope for a better vision to replace Nasser's--and the even darker dreams of the Islamists--though the magic formula has yet to be found. Raymond Stock, a Shillman-Ginsburg Writing Fellow at the Middle East Forum and Instructor of Arabic at Louisiana State University, spent twenty years in Egypt, and was deported by the Mubarak regime in 2010.